Berlin crime gangs of Arab origin have long earned infamy with violence and brazen robberies but now, police warn, they have targeted a new generation of refugees for recruitment. Known in the media as Berlin's "clans," whose founders themselves fled war in Lebanon in the 1980s, they have long controlled much of the city's illegal drugs trade, street prostitution and protection rackets. While East European- and Asian-organized crime and homegrown biker gangs are also active, the clans have been especially visible, given many members' love of gangster bling and muscle cars. The dozen or so Arabic and Kurdish-­origin extended families, with their patriarchal structures and codes of honor, have also been mythologized by rap artists and ­portrayed in the TV series 4 Blocks. Now police warn that the clans have sought out new members from among the over 1 million asylum-seekers who have arrived in ­Germany since mid-2015, half of them from Syria, Iraq and Afghanistan. The clans "are trying to get others to do the dirty work" such as selling drugs or committing small burglaries, said Benjamin Jendro of the GDP police union. Many refugees, he said, are "men who have arrived alone in Germany" and who "have not yet had to do with the justice system," making it less likely that they will go to prison if caught. An undercover police investigator also told Die Welt newspaper that "above all, it is the young, physically strong men who are in the sights of the clans, who make them do the dirty work." The migrant wave that peaked three years ago sparked a xenophobic backlash in Germany, and stoked heated debate about integration efforts and crimes committed by foreigners. This has thrown a new focus on the clans and raised questions about how Berlin's police could let them openly flout the law for so long in a generally fairly low-crime country. Germany's best-known rapper, Bushido, long boasted about his close ties to one Berlin clan - until they had a falling out this year and he sought the protection of a rival group. Bushido's wife, Anna-Maria Ferchichi, told news weekly Stern that the couple now feared for their lives from gangsters who had formed "parallel societies right here in Germany." 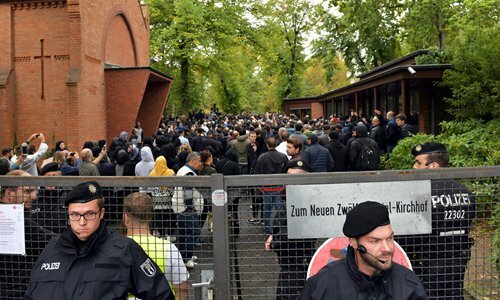 The clans' latest show of force was the September 13 funeral of an infamous underworld figure, when 2,000 mourners congregated in the Islamic section of a Berlin cemetery, watched over by some 150 policemen. In scenes Stern described as "worthy of a mafia movie," they paid their last respects to Nidal Rabih, a 36-year-old violent repeat offender who had been shot dead in front of his family days earlier. Rabih, a Palestinian born in Lebanon, had achieved cult status in the Berlin criminal underworld. Boasting more than 100 offenses from robbery to attempted manslaughter, he had spent more than a decade behind bars but avoided a 2004 deportation attempt when Lebanon refused to issue him a passport. Days after his death, Berlin municipal workers guarded by police whitewashed over a wall mural at the murder scene that depicted Rabih in the style of a martyred Islamic fighter. Sociologists say the story of Berlin's clans is a cautionary tale about failed integration. Their patriarchs mostly arrived in the 1980s as refugees from then war-torn Lebanon, among them ­Palestinians and members of ­Turkey's Arabic and Kurdish minorities. Many had only temporary protection status and "did not have access here to education or work," said Islamologist Mathias Rohe, arguing that this sped up the descent into delinquency. The extended families, aside from now running large chunks of Berlin's illegal economy, have also committed some of the city's most headline-grabbing criminal stunts. In 2010, masked men wielding machetes and guns robbed a poker tournament in the Berlin Grand ­Hyatt, making off with about 240,000 euros ($270,000). In 2014, robbers rampaged through Berlin's KaDeWe luxury department store, smashed glass displays and stole watches and jewelry worth 800,000 euros. And last year, clan-linked bandits stole a 100 kilogram Canadian commemorative gold coin worth over 3.75 million euros from Berlin's Bode museum, around the corner from Chancellor Angela Merkel's apartment. Berlin's police is now under fire for having long neglected the problem - something researcher Ralph Ghadban blames partially on a "fear of stigmatizing and discriminating against certain minorities." In recent months, authorities have started to hit back by stepping up raids on shisha bars and betting shops, many in Berlin's Neukoelln district, and confiscating expensive cars for speeding. In August, police and prosecutors seized 77 properties worth 10 million euros, alleged to have mostly been bought with proceeds from a major 2014 bank robbery. Some of the properties were officially owned by one convicted bank robber's 19-year-old brother whose only declared income was state welfare. The confiscations still have to stand up in court against challenges from the clan's expensive lawyers, but authorities believe they have struck a first blow. "We're stepping on their toes," said Berlin Interior Minister Andreas Geisel. "We're spoiling their fun in Berlin."